BAT Multi-Grip Framing Anchors offer the most effective and economical method of providing strong, mechanical joints for framing of timbers. MFAAL & MFAAR for anchoring rafters and trusses to wall plate. MFABL & MFABR for anchoring headers to studs, beams to posts and studs to plates. 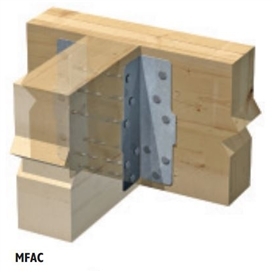 MFAC for right or left handed use – for anchoring joists to beams, stringers to headers and hip joints.